Is it possible that some melodies are so infectious--so right on the zeitgeist--that they aren't written, but rather, captured? Today in "That Sounds Like," the "TSL" team submits that Bowie's Rebel Rebel Sounds Like Pharoah Sanders's The Gathering . These songs were written an ocean apart, and in different musical solar systems in the early 1970s. In spite of their relative popularity, it strikes me as much more likely that Bowie would be listening to Sanders than vice versa. Bowie notoriously casts a wide net of listening and he plays the saxophone; even so, I don't think I've ever heard about Bowie rolling into all the downtown free jazz clubs. Don't be too distracted by the eyepatch. Note the earring as well. This was released in 1974, but was potentially written back in 1973. For a number of reasons it's unlikely that Bowie had ever heard Sanders's The Gathering. So we leave it to you loyal listener. One melody that rose up in different places in the early '70s, just like calculus in the 17th Century. During my brief period of melodica-ownership, I noticed most people reacted to it as kind of a joke. Fair enough, I suppose; it’s got these silly little keys, and sounds kind of honky and funny. 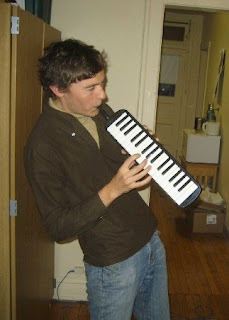 And given the way I played the melodica, it kind of was a joke. But the melodica in the right hands is a wonderful, dynamic little instrument. Sure you can’t tune it, but to banish it to “quirky for the sake of quirky” along with instruments like the moonshine jug or the timpani is only doing yourself a great disservice. I’m going to stop short of saying that a mutual love of the melodica brought reggae musicans and post-punk musicians together, resulting in the white-hot dubstep of today-- but that’s probably true if you’re willing to overlook things like chronology. 2. Bob Marley- Sun Is Shining. from African Herbsman. 4. Gang of Four- 5.45. from Entertainment! At the risk of confirming everyone’s suspicions that millennial are all waxing nostalgic for a time we didn’t know—we’re getting used to baby boomers projecting all of their self-loathing on us—I’d like to explain why we millennials pretty much only pay for music when it comes on vinyl—a format that arguably was surpassed before we were born. For those who don’t know, the LP is still marching along, the musical format that refuses to die. In 2010, vinyl sales were up 26 percent. Contrast that to CDs, which fell 21 percent, and the music industry saving-digital download sales that crept up just 2.1 percent. Records are becoming so mainstream that the counter-culture has revived cassettes. Some of this can probably be attributed to retro-pastiche. Vintage turntables and dusty LPs, like books on a shelf, have looked natural and attractive in the American home since the ‘40s. But surely there’s more to it than that. People are fanatics about their records. There’s an entire “Record Store Day,” that—in Chicago anyway—saw droves of young dudes (of every age and gender) flipping through crates. Stores with names like “The Dusty Groove” were packed. People were squeezing through aisles, even as outside the freezing rain made a compelling case for downloading. Why? There’s an obvious and less-obvious appeal. Let’s start with the obvious: Records just sound better than mp3s. For all the popping and crackling, records can be cleaned. The mp3’s damage is inherent in the design. I’ll admit there’s a really complex way of explaining how an mp3 is made, and then there’s this one. It’s reductive and without nuance, but as you’ll see, this is how mp3s are made. It’s appropriate to the format. The mp3 caught on because unlike older digital music formats (.wav’s for example), the mp3 takes up very little hard drive space. The nature of creating an mp3, or AAC or any other “lossy” format causes certain sound frequencies to be eliminated. The AAC, Apple’s default format, is especially sharp at eliminating frequencies that are outside of the hearable spectrum, or being covered by another instrument like a heavy bass, anyway. In theory, everything you would hear should be there. It’s not as wide of a spectrum of sound, but if you’re listening to music via earbuds on the subway, the difference is probably negligible. Additionally, as the audio is encoded, a decision has to be made as to how detailed the digital representation of the audio wave will be; this is where “kbps” is introduced. Think of it visually if it helps: How many pictures of this horse running do you want to take per second, to recreate the visual experience of seeing it run? Think of the choppiness of not having enough frames per second. If you’re a really visual person, draw a sound wave rising and falling (go ahead, I’ll wait). Now draw a staircase going up (and down) the wave. This is the digital version of the sound wave. Note the corners. Note how right angles are just so much less.... organic. To be fair, good mp3s should have around 320 bits per second (contrasted with the typical Hollywood which has only 24 frames per second). It’s a clever way to get a lot of music on a small hard drive. So what are we missing? To test just what differences these compressions and eliminations might make, I devoted an entire afternoon to comparing the sound quality of an album. I opted for Blood Sweat & Tears’s 1968 debut album Child Is Father to the Man because I thought its diverse musical styling—orchestral overtures, ‘60s pop, folk, R&B, jazz—would provide a broader scope for comparing formats. Also I had found a cheap copy at the record store, and hadn’t really had a chance to sit down and listen to it. The experiment, which took place on a cold drizzling Sunday, was so indulgent and enjoyable that I’d recommend everyone buy a turntable just for conducting it. I sat down and listened to each track twice through the same stereo—once off my laptop at 256 kbps, and once off my turntable—alternating which format played first. From a sound standpoint the difference is definitely noticeable. The organ especially, here played by Al Kooper of “Like a Rolling Stone” fame, has a full, thick, angelic quality on vinyl. On the computer the same organ parts are present but sound much smaller and airier. Via LP, the bass parts are much more textured, almost purring on the record. The cymbal splashes from the drum kit sound light, never shrill. Overall everything sounded much more realistic. Instruments were easier to distinguish on vinyl: I could hear the long decay of hits on the vibraphone, which on the digital recording I thought was a Rhodes piano; for the first time in my life I thought “What a fine lute part this song has!” Your ear may not hear the frequencies that are present, but they still make a difference in how everything sounds. In a direct comparison, the mp3 sounds fine but not as good. Audiophiles will argue that I stacked the deck by using a “lossy” format. Yeah, I could’ve found some FLAC files, which preserve CD quality, but are thus immense. And perhaps in technology’s forward march, they will figure out how to preserve the highest quality recording but find a manageable way for you to listen to it portably and conveniently. It seems for the time being, “cloud streaming” is two steps back, but if consumers decide they want higher quality, I’m sure someone will figure out how to sell it to them. Apart from my slight audiophile tendencies (okay, full-blown epidemic audiophilia) there’s something else about vinyl records. The less-than-obvious advantage. Child Is Father to the Man has some of the most amazing production I’ve ever heard—really exciting horn parts, big apocalyptic choirs, lead vocals oscillating through a spinning Leslie speaker, just a whole album of interesting and cool choices. I don’t usually evaluate albums based off of these merits, and this brings me to perhaps vinyl’s most enduring strength. I sat listening with my notebook in hand and the record jacket next to me. In between notes (usually on the second consecutive listen of a song) I read the back of the jacket. The cover of Child Is Father to the Man is silly and kind of disturbing (each band member is next to a child with said band member’s head imposed on the little shoulders. Each one is creepy in a unique way). At one point in the fourth track, “My Days Are Numbered,” a big Revolver-style backwards guitar solo just rips in. It’s a great moment, which the jacket credits it to Ztak Evets. Immediately I wanted to figure out what else this Dutch guitar master had done, but my computer was of course in use, so I contented myself with noting to look it up later. In the past that moment—that whoa—would’ve been the jumping off point, and I wouldn’t have finished the album. I would’ve been off on a wild Google, YouTube, iTunes hunt, trying to consume another musician or style I didn’t know, rather than actually listening to music at all. In this case I probably would’ve gone back to Blood Sweat & Tears after realizing that Ztak Evets doesn’t exist, it’s just the BS&T guitarist Steve Katz, spelled and played backwards. Nevertheless, an mp3 is easily turned on, and easily turned off. The limitations of vinyl—its lack of portability, its dependence on the user to flip it every 25 minutes or so, the fact that record players can’t go online—all serve to create a space for music. The mp3 player and the computerized music library allow you to have music going all the time; this is their strength. You can come home with your earbuds in, slam the iPod onto the iPod dock and hear only the slightest interruption. Everything we do can be soundtracked, and that’s cool! Rather than walking up the street to the sound of cars and traffic, I can walk up the street listening to The Cars and Traffic. With the slightest movement of my fingertips I can get more, put more on, play it in any order I want, even repeat one song infinitely (That “Play One Song Forever” button has been on every version of iTunes since the beginning, and I can’t for the life of me imagine why). But vinyl won’t go for a walk. It sits in my living room, in a specific place, sort of set apart. When shopping for records, I can curate to a specific room. There’s a whole ritual of taking the jacket out of the dust cover, the sleeve out of the jacket, and the LP—carefully!—from the sleeve, lining up the hole, and moving the needle in place. Calling these actions holy or liturgical in some way is overstating it, but it is an act of reverence. It takes away the everydayness (or every-momentness?) of now-ubiquitous recorded music and reminds you that it’s a privilege, a treat. Creating a space for music, giving it attention. It is (a lesser form of) the difference between a poster of a Van Goghon your wall—novel at first, and eventually peripheral—and going to see “The Old Guitarist” in a museum. You prepare yourself to let the art in. It sounds over the top, and yeah, it kind of is. Think of it like the slow-food movement: vinyl lovers are enjoying music’s ritual, and quality—all served up on a platter. All of this is possible with digital music, sure. Of course, airplanes could just be driven around on the highway. Just as the merits of paintings, aside from being just “a permanent record,” became clear with the birth of photography, the merits of vinyl in an mp3 world are only now coming in clear. Warm, punchy, and clear. N: Not the only record I picked up that I was more than familiar with, I was more or less guilted into buying this because, alas, I don’t actually own this on any format. Lucky I did, Faust IV is an undisputed classic. B: Sounds like the Sgt. Pepper from beyond the Berlin Wall (though they’re from the West). I imagine many interesting production choices had to be made; making the vinyl well-worth the price of admission. N: “Slow Motion” still knocks me flat. It’s also worth mentioning that the B side has a looping runoff groove, meaning the record will continue to play and never end until you lift the needle, which is as cool as it is sort of annoying. B: Russell is so cool as to be a little on the nose: New York, Retro-Dance, Avant-garde composer. Even if you feel “over” the elements, the result is both undeniably cool, and pretty fun and welcoming. Very minimal environments--drum machine, couple synth lines, supplemental percussion and usually Russell’s cello--permeated with a voice that meanders between Bill Callahan and Aaron Neville. Like an animated corpse of disco music stalking the streets of Daydream Nation’s New York. N: One of a couple Box Tops singles I found at the Numero pop-up store, this one features the Alex Chilton original, I See Only Sunshine. The track features Chilton’s amazing knack for melody, you can almost hear him trying to shrug off the gruff soul singer affectation and just open up on this one. N: I had to round out the Chilton collection with Big Star’s 3rd. Living up to its reputation, the album is incredibly sad, even desperate at times, filled with beautiful string arrangements and some of Chilton’s best vocal takes. His voice sounds alternately tender and ragged. This is an incredibly ambitious album, even when held next to #1 and Radio City. I wonder if that ambition comes from the desperation of being at the end of the rope as a band, or if Alex Chilton was just ready to move far away from the sound he’d already perfected over the last two releases. This might be my favorite Chilton record I’ve heard so far. B: A power-pop apple, far from the tree. On par with Lou Reed’s Berlin for overall bleakness. Nevertheless, has some real gems both on the happily sad and the extremely forlorn ends of the spectrum. N: One of my favorite EPs of all time, this is by far my favorite Mission of Burma release, especially for the fist-pumping Academy Fight Song. N: The only Numero release I picked up at their pop-up shop, the story behind this 12” is that the label discovered a bootleg 12” floating around filled with samples pulled from their releases. Instead of issuing a cease and desist, Numero decided to distribute it themselves. What starts off as a fairly engaging mix ends up being pretty brilliant by side 2. This isn’t really a party starter, unless the party is a small BBQ, but it is a fantastic headphones album. Also, another album with a looping runoff groove on the B side, for whatever reason. Ugly cover though. Curiosity got the better of my judgement, and now I own this. Oddly enough this early artifact of “Christian Rock” is dogged by the very same things that dog the Christian Rock of Today. The songwriting is written in a self-assured second person, one who has all the answers knows exactly what you should do. The songwriting generally lacks specificity, which as we’re told in Strunk & White’s The Elements of Style is crucial to good writing. “If those who have studied the art of writing are in accord on any one point it is this: the surest way to arouse and keep the reader’s interest is by being specific, definite and concrete,” states S&W, going on to cite the book of Ecclesiastes as an example of strong writing. Contrast this with Holy Fuzz’s ninth track “Dry Ground” by the Exkursions: “Don’t lie to yourself. Take things as they are. That’s the first step in becoming a much better person by far.” Bush league stuff, Exkursions. But then psychedelic music—Christian or otherwise—isn’t known for its lyrical acumen. You want to know how the jams am, how the grooves do, how face-melters smelter. They’re... fine, I guess. Within the psychedelic music world I’ll admit I like a bit more subtly and nuance (okay, melodious and fey) over early/harsh/heavy. This compilation is the latter for sure. I guess I was hoping for some sort of psychedelic spirituality; it’s odd that something so concerned for your soul would seem so soulless.